In the age of social media, life writing is ubiquitous. But if life writing is now almost universal—engaged with on our phones; reported in our news; the generator of capital, no less—then what are the limits of life writing? Where does it begin and end? Do we live in a culture of life writing that has no limits? Life writing—as both a practice and a scholarly discipline—is itself markedly concerned with limits: the limits of literature, of genres, of history, of social protocols, of personal experience and forms of identity, and of memory. 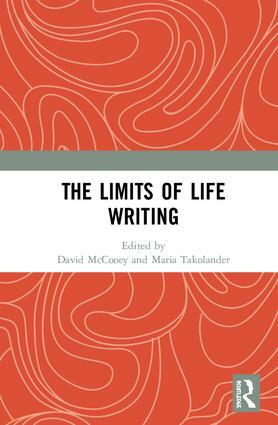 By attending to limits, border cases, hybridity, generic complexities, formal ambiguities, and extra-literary expressions of life writing, The Limits of Life Writing offers new insights into the nature of auto/biographical writing in contemporary culture. The contributions to this book deal with subjects and forms of life writing that test the limits of identity and the tradition of life writing. The liminal case studies explored include magical-realist fiction, graphic memoir, confessional poetry, and personal blogs. They also explore the ethical limits of representation found in Holocaust life writing, the importance of ficto-critical memoir as a form of resistance for trans writers, and the use of ‘postmemoir’ to navigate the traumas of diasporic experience. In addition, The Limits of Life Writing goes beyond the conventional limits of life writing scholarship to consider how writers themselves experience limits in the creation of life writing, offering a work of life writing that is itself concerned with charting the limits of auto/biographical expression. This book was originally published as a special issue of Life Writing. David McCooey is the author of the prize-winning Artful Histories: Modern Australian Autobiography (1996/2009). He has published widely on Australian life writing and poetry, and he is also a prize-winning poet and editor. Maria Takolander is the author of Catching Butterflies: Bringing Magical Realism to Ground (2004), as well as numerous scholarly essays on magical realism and theories of creativity. She is a prize-winning fiction writer and poet.